Last month, I worked in Andrew Eller’s amazing 4th grade classroom in Los Angeles that was beginning an exploration of factors and multiples using the game Prime Climb. If you have never played the game, PLEASE take a minute and think about their design. What do you notice and wonder about this chart? Can you predict what 30 would look like? 21? 60? On the previous day, Mr. Eller led a notice and wonder on the first 20 numbers, then 100, and then the kids had time to explore the charts on their own. Some of the kids were using the colors/prime factors right away, others were not. What I realized was that these 4th graders had a lot of experience with finding factors, but only two factors. Like factor pairs. Thinking that the factors of 16 are 2, 4, 8, and 16, because 1 x 16 = 2 x 8 = 4 x 4 = 16. They didn’t have a lot of experience thinking about 16 = 2 x 2 x 2 x 2. Which would make the colored circles harder to use when playing the game. And those circles are the key to mathematizing the game, I think. In Realistic Mathematics Education (RME), we think about how particular mathematical models are worth investing in, because they shape how kids think about mathematics. The number line, for example, is not just a visual, but a tool that offers certain affordances in HOW you think about operations (and pretty much all of mathematics). But I could write an entire post about the difficulties of representing the associative property with number lines or arrays. It gets a bit convoluted . . .
That is where I think the colored circles have a really interesting and concrete role to play as a possible model for the deep structure of numbers as factors. To think of 60 not as the pairs of numbers that multiply, but the core factors, the prime factors, that is something that is challenging to represent in a way that it becomes intuitive for kids. But that is the genius of Prime Climb. I wanted the number string to call attention to how the prime factors were related, so that kids could see the connections between related multiples. A number string is a beautiful way to call attention to mathematical patterns, since we do one problem at a time, and we focus on developing our collective noticing of emerging patterns. I decided to focus on multiples of 5, since that would allow everyone to engage in thinking about the model, while feeling comfortable with the facts. We start pretty simple, with the basic- how do these colors work-problems. I noticed that there were a few kids who did not leave class the day before with that understanding- they just didn’t use the colors at all. I thought this might make it more explicit for those kids. The string design focuses on kids not just multiplying, but visualizing and justifying the prime factors of the number, so I asked, “what did you get, and what colors will the circle be? Why?” I did not show the “answer” until kids have described it and justified why it would be any particular colors, and how many segments it would have. Before I move on, here’s what made me uncomfortable with this format. I really wanted to do a string with the circles, not just with the numbers, because I wanted the kids to start thinking WITH the factor/circles. But the best way I thought to do that was to make a powerpoint, so I could reveal the “answer.” This was an awkward part of this number string- normally I represent multiple student answers, and here there is just one? Not sure how to resolve that . . .It seemed to work well in this group, since our discussion was mostly about strategies, not answers. But I wonder if others have thoughts. Is this format TOO constrained? Am I pushing this model too hard? Next we get to problems with more than two factors, which led us to equivalence, and the associative property. On the second slide, I went for another equivalence example, this time with 2 x 3 x 5 and 6 x 5. There was some great conversation on the relationship between the two. The problems end with more equivalence, but here I want to get kids to use what they noticed about multiplication from the previous problems to make a challenging problem simpler. I recommend a turn and talk for the second to last problem, which is the stumper (last problem of a string, challenging, and has multiple ways to solve) here. Our discussion was around how kids dealt with multiple factors, some rearranging (using the associative property). And then I asked what they think the last problem might be . . .
A good final question might be, how many ways can we make 60? I have some ideas for other number strings that would build off the game: division could be very interesting, and perhaps repeating 2s for students to think about what patterns emerge when we multiply 2 x 2 x 2 x 2 x 2 . . . What else? Here is the Google Slide of the string with animations. The following post comes from Rafael Quintanilla, a Mathematics Instructional Coach for the Los Angeles Unified School District and a long-time teacher of number strings. 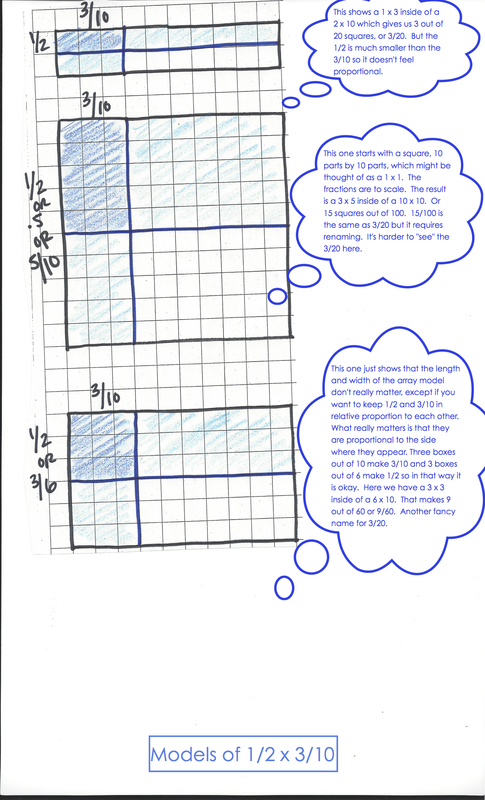 About eight years ago, I was teaching fifth grade and I wanted students to begin to see relationships between halves, fourths and eighths, be able to decompose fractions into unit fractions, and have an understanding of scaling when multiplying. So I decided to write and try out some strings that focused on benchmark fractions as helpers and then go from there. I used a number line as a model because that is what we tended to use as a fraction model because the students were able to connect it to real life applications. I decided to use the context of a bicycle ride because students can relate to to riding bicycles and because they can picture a straight bicycle ride (I let them know I ride my bicycle on the riverbed next to my house), hence the number line. Students are really engaged in this string because as the string develops, I tell a story of why we stopped at certain places. Some of the “look-fors” in the string is that students might just give you numbers instead of saying the numbers represent miles on a bicycle ride. Be careful because students will see the numeric patterns that exist but not make connections that these numbers represent fractional distances on the ride. Context: On weekends, my friend and I enjoy riding our bicycles. Our goal is 24 miles. But sometimes, we stop for breaks. Keep in mind that the goal of the string is to multiply fractions by a whole number. Therefore, the teacher puts the tick mark on the number and labels the fraction. The students are computing the number of miles and developing strategies. The goal of the lessons is to allow students to discuss the relationship between the fraction and the whole. The goal is not to determine where the fraction is located on a line. That is why the teacher marks the location. Also do not worry about rushing into writing the expression or equation. A 5th grade teaching team I work with recently raised the issue of how to model the problem 1/2 x 3/10 on an array. They saw their students use a variety of models and one teacher got “bothered” by how some of the models felt “imprecise” or “not to scale.” We had a conversation together about this issue. To prepare myself for the conversation I did a little sketching of possible models that kids might use. What do you think?